Institute technology management & business planning unit at ICAR-IIHR Bangalore’s model of horticultural technology licensing & incubation and handholding support for incubation have proved successful and sustainable pathways for effective and quick technology dissemination far and wide. This model not only helped institute earn over Rs. 8 crores within nine years, reach out to over 400 clients and enhanced the visibility of the institute as well. A premier R&D institution working exclusively on over 40 horticultural crops, ICAR-Indian Institute of Horticulture Research (IIHR), Bangalore has been a significant player in bridging food security gaps through its dedicated and relentless research efforts towards crop productivity enhancement. ICAR-IIHR in the last five decades of its existence has released and popularized over 128 improved varieties and hybrids in different horticultural crops. A number of these technologies have been widely adopted and benefitted a number of farm families realise improved farm income and family welfare. Over the years, it is being realized that besides technology development, their effective dissemination and large scale adoption is essential to enhance the visibility and effectiveness of the research efforts put forth by premier research institutions like ICAR-IIHR. 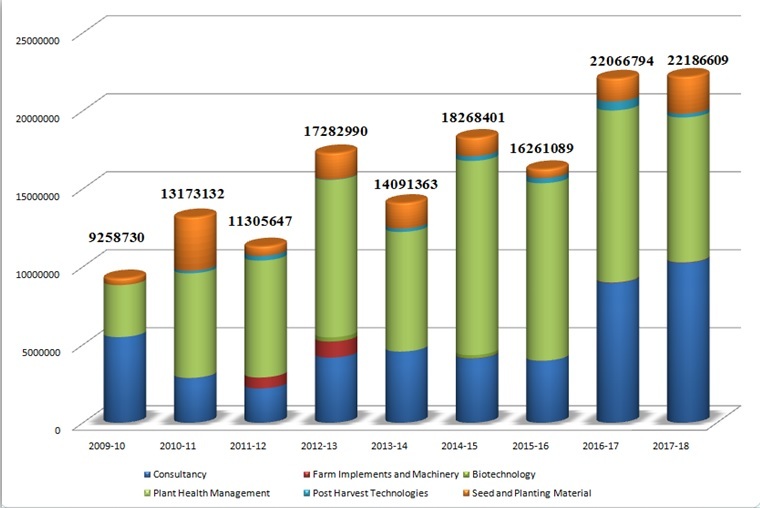 The Institute Technology Management Unit (ITMU), which has been operationalized since 2008-09 as a part of the ICAR’s IP policy has since commercialized over 100 technologies under five distinct categories / theme areas such as, , (i) seed and planting material (ii) plant health and nutritional products (iii) post-harvest technologies (iv) biotechnological products and (v) horticultural engineering products, through licensing to private and public entrepreneurs or individuals for an up-front technology fee coupled with an annual royalty clause of 2-5% under a mutually agreed terms and condition (MoU) executed between the institute and the licensing party for a specific period of 5 to 10 years. The institute has licensed over 100 technologies to around 400 clients and earned an IP related income of Rs. 8 crores in the last nine years ( Fig 1). A number of licensees have been successfully been multiplying the products under the brand name ‘arka’ and have been supplying to reach large number of horticultural crop producers and other stake holders.